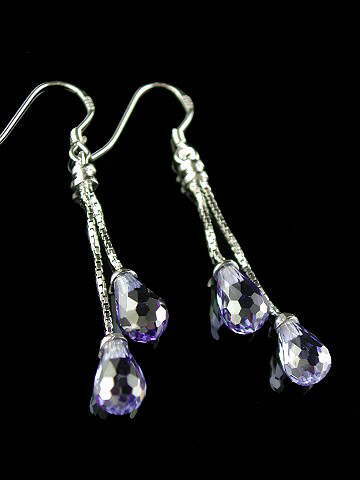 Stunning double drop faceted pear-shape Siberian Tanzanite earrings suspended on rhodium-plated 925 sterling silver box chains with 925 sterling silver ear wires. As every computer monitor colour & resolution is different, the best way to describe the colour of these beautiful earrings is pure violet. The colour is far, far better than we were able to capture in the photo and they sparkle with a vivid brilliance.